, nephew to the preceding, and heir to his taste and munificence, was born in Rome, 1720, and educated for the church, in which he was speedily promoted to the highest honours, being advanced to the purple, soon after he entered the priesthood, in 1747, and not long afterwards appointed arch-priest of the Basilic of St. Maria Maggiore, and bishop of Porto, one of the seven suburban sees which depend on the pope as on their immediate metropolitan. He derived more lustre, however, from following the example of his uncle in patronizing learning and learned men, and in adding to those rare and valuable monuments of art, which so long rendered the villa Albani the resort of the virtuosi of Europe. 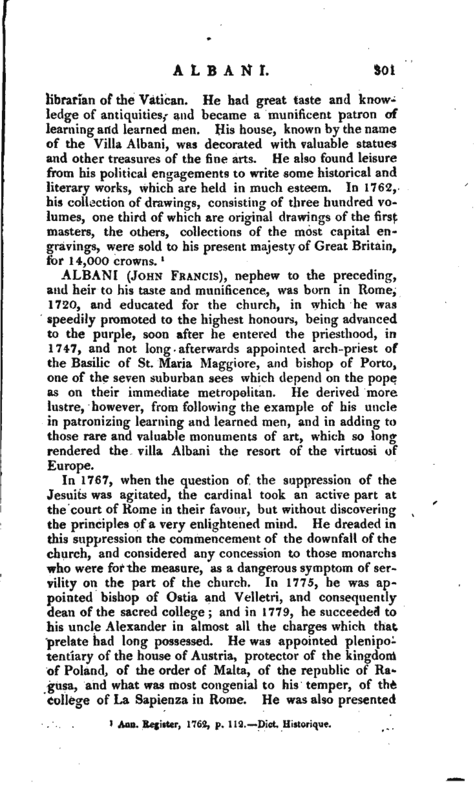 In 1767, when the question of the suppression of the Jesuits was agitated, the cardinal took an active part at the court of Rome in their favour, but without discovering the principles of a very enlightened mind. He dreaded in this suppression the commencement of the downfall of the church, and considered any concession to those monarchs who were for the measure, as a dangerous symptom of servility on the part of the church. In 1775, he was appointed bishop of Ostia and Velletri, and consequently dean of the sacred college; and in 1779, he succeeded to his uncle Alexander in almost all the charges which that prelate had long possessed. He was appointed plenipotentiary of the house of Austria, protector of the kingdom of Poland, of the order of Malta, of the republic of Ragusa, and what was most congenial to his temper, of the college of La Sapienza in Rome. He was also presented | with some rich abbeys and priories, both in the Roman and in the Neapolitan state. The circumstances of his being almost set apart from every affair of government, and of possessing a large income, were a source of refined gratifications to himself, and of signal benefit to all the literary characters in Rome who had gained his esteem. He renewed towards the close of the century, that example which about the middle of it had been set by his illustrious uncle. Besides his patronage of men of established fame, of such men as Visconti, Fea, Testa, and Piranesi, whenever among the children of his servants and dependants he discovered a promising, genius, he took upon himself the care of his education. 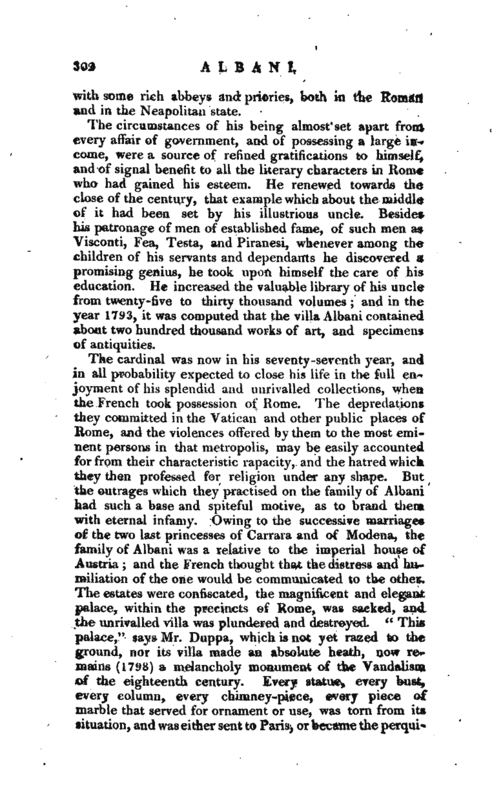 He increased the valuable library of his uncle from twenty-five to thirty thousand volumes; and in the year 1793, it was computed that the villa Albani contained about two hundred thousand works of art, and specimens of antiquities. Athenæum, vol. 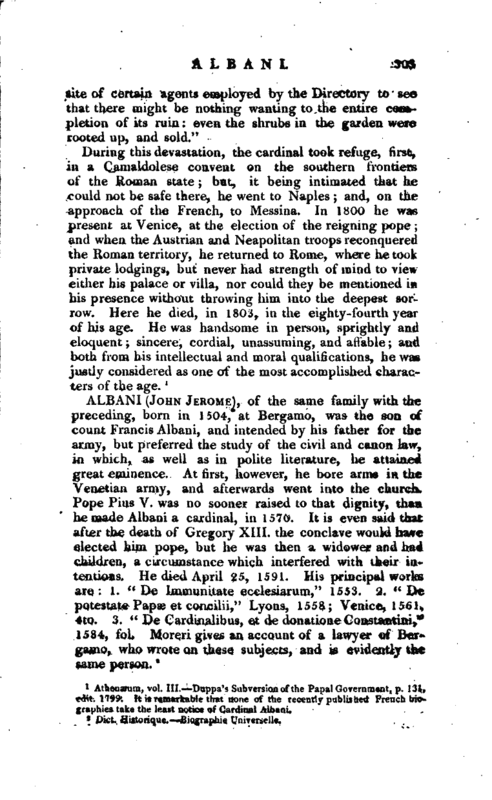 III.—Duppa’s Subversion of the Papal Government, p. 131, edit. 1799. It is remarkable that none of the recently published French biographies take the least notice of Cardinal Albani.